Organizational design is a process for integrating technology, people, and information within an organization. It is used to enable the physical organizational form (people, technology, processes etc) achieve the stated goals or strategy of the organization. Simply stated, by using an organizational design process we are aiming to maximize the organizations chances of delivering it’s strategy. 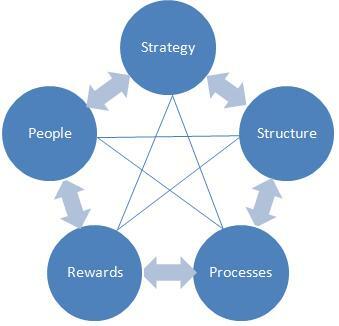 We can see in the above diagram that the 5 categories of policies are: Strategy, Structure, Processes, Rewards, and People. Let’s look at each of these categories briefly. Strategy is the first set of policies to be tackled in the Star Model. Strategy defines the direction of the organization. It is important to tackle strategy first because any organizational form we end up with will involve compromise, so by setting the strategy first it enables us to make the right compromises. Specialization: refers to the type of specialists which will be needed to get the work done and their number. Shape: refers to how many people exist at each level of the organization. Clearly a flat organization will result in lots of people at each level as opposed to a more hierarchical organization. Distribution of Power: refers to centralization vs. decentralization along with whether we push power down through the organisation to where the issues and information are or whether we want all decisions to go through decision making bodies. Departmentalization: refers to which departments should be formed. Process policies determine the flow of information and decisions in the organization. We can trade off between processes which are vertical (budgeting and planning) and lateral (collaboration based). Reward related polices aim to ensure that the goals of the employee are aligned with organization. This provide motivation to employees to move the organization towards the strategic goal. These policies relate to how people are recruited, rotated, and trained etc to ensure the organization has the talent to follow the strategic direction in an efficient manner. How does all this relate to me? You may well be thinking that this is all very well and good if you’re on the group executive board of a major corporation but not if your project managing a very small team in a small company. This is not the case in my opinion. No matter what size of team you are responsible for you should be asking yourself how your team performs in each of the 5 categories of policy. Ask yourself questions such as – is what we’re doing clearly linked to the strategy? 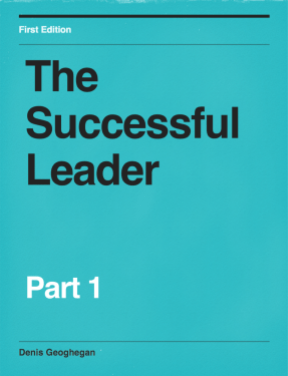 Do we have the right people and are decisions being made at the right level? Are you ensuring rewards are in place for your team if they succeed? Do we have the right departments (or skills in a small organization)? By asking these questions, using the Star Model as a basis, we can find issues even in the smallest of team, enabling us to make adjustments to shape behaviour, and thus get the results we want.